Your fitness and Pilates retreat escape fulfilled, for 5 nights – offering 5 fitness options daily, delivered by London’s top trainers: Pilates, circuit training, yoga, hiking, stretching, meditation. 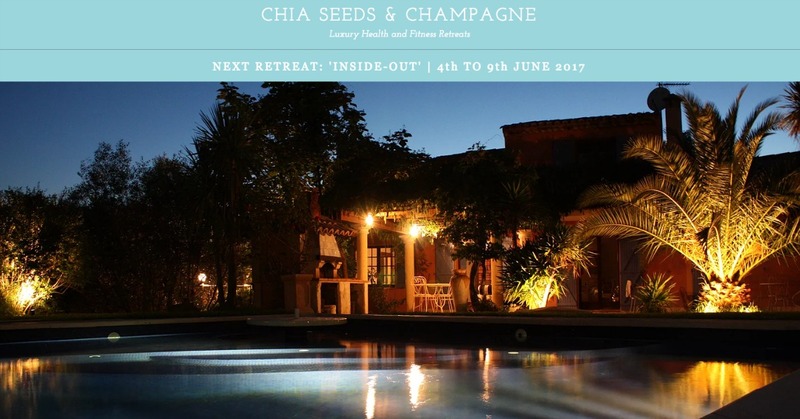 Expect a menu expertly designed to replenish body and mind, a stunning St. Tropez villa and a challenging fitness programme delivered by Holly Howard, renowned personal trainer and nutritionist, and David Kingsbury, founder of OPUS in Notting Hill. Chia Seeds and Champagne is a new breed of luxury health and fitness retreat, and will be based at Villa Tropez in early June. Each retreat is uniquely designed, and this June the focus is on ‘inside-out‘, with fitness based on the development of core strength. Menus and supplements are selected to nourish your digestive system. With plenty of free time to enjoy a massage by the pool or read, this is a balanced health and fitness retreat – skinny champagne included! Nothing is compulsory and everything is encouraged in moderation. The 6 day retreat creates the opportunity to take time out and return fit, rested and nourished. Come and join the team at this stunning villa with soul, and nourish from the ‘inside-out‘. 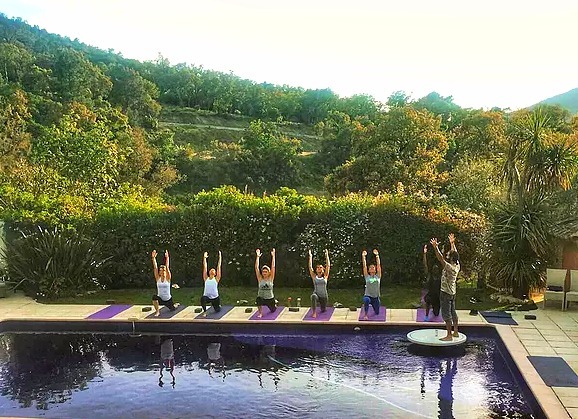 The fitness & Pilates retreat offers fitness classes that are uniquely tailored to the group’s needs but are varied daily. All sessions include heart rate elevating activities – such as hikes along the picturesque vineyard lanes, pilates-based sessions in the sanctuary of the garden, circuit classes, body weight exercises, abs blasts, a water workout in the quarter-Olympic size resort pool and even a stretch session to ease those developing (aching) limbs. We combine educated and effective fitness in the most glamorous location to make each session hard but enjoyable. Gentle encouragement is the key, rather than drill-sergeant boot-camp style. Remember it is your decision how many activities you participate in. A tough love workout for those who fancy it, or perhaps the pétanque boulodrome is all that is required. Nourishing your body with fresh and nutritious food to allow your digestive system to rest and replenish is the main objective. The retreat offers a varied selection of fresh, healthy food, refreshing juices and mood-boosting smoothies. The menu – developed by Holly – is sourced from high quality, local produce and and includes two digestive rest days to complement the bespoke range of supplements included in the Health package. Holly enjoys cooking with alkaline-based, gluten-free ingredients and incorporates her knowledge of traditional Chinese food energetic principles into her cooking. Villa Tropez’s glamorous environment alone is replenishing, but we’ll pair this with a warm welcome from the Saint Tropez sun (fingers crossed), highly qualified and industry renowned personal trainers, yoga and pilates specialists and ample free relaxation time. This retreat will allow you to sweat away your stress, create a fresh and clean state of mind and recharge. Afternoon at leisure to enjoy the private resort facilities of Villa Tropez, relax by the pool, soak up the sun or explore the local area. Dinner on the terrace with the sun setting over the rolling hills of vineyards and olive groves. Linen, towels and beach towels. Yoga mats, blocks and straps (please feel free to bring your own if preferred). Excursion to Saint Tropez on Tuesday the 6th with ample time to browse the famous markets and a boat tour around the bay (weather permitting). A pre-health questionnaire will be sent prior to the retreat so we are aware of dietary requirements or medical needs. Travel insurance – we strongly suggest purchasing travel insurance in case of illness or injury, personal or family emergencies, weather etc. Any transfers/ transport arrangements for times outside of the allocated group transfer must be paid at own expense. We can arrange visits to local beach clubs in advance, Nikki Beach, Le Club 55 etc.